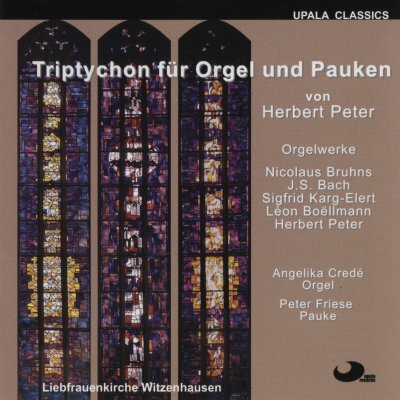 Aus "Drei Präludien und Fugen"
Toccata "Engelkonzert" - Ostinato "Ostermorgen" - Pfingstwunder und Hymnus "Komm, Heiliger Geist"
The composition was inspired by the three stained glass windows in the choir of the Liebfrauenkirche in Witzenhausen, which were created in 1962 by Hubert Diestler, Munich. According to the artist, the windows emblematise the three main holidays: Christmas, Easter and Pentecost. He uses abstract forms and symbols in association with light and colour as means of expression. On all three windows a large central figure stands out, which is associated with smaller light groups on the perpendicular line. For the composition of the triptych, this formal arrangement was the basis for the use of appropriate musical forms. Abstract depictions allow a certain freedom of interpretation. In dependence of the topics defined by Diestler, the composer beholds in the three large central figures the angel of annunciation proclaiming the Christmas message, the Easter Sun and the assembly of the Pentecost congregation at the outpouring of the Holy Ghost. In the Christmas window, praising angels rise above the angel of annunciation, expressing their joy in the composition with organ, harp, timpani, trumpet and flutes. The arranged parts are merged into a toccata. With the sound gradually dying away, the music-making angels depart at the end of the toccata. Without a pause, the music switches over into the second movement. In the Easter window, the small picture elements rising from the depth represent the way "from the crucifixion to life". The movement begins with gentle timpani notes, which symbolize the hammering on the cross and the apprehensively beating hearts of the three women, who went to the tomb on the Easter morning. For the continuation, the form of a passacaglia was chosen, a form of composition which uses repeated bass themes (Ostinato), which is suitable for the gradual development of the mourning on Good Friday to the resurrection under the light of the Easter sun. With a sudden harmonic change of one note, the Easter event comes to pass, ending with a bright major chord. The third movement is also directly attached to the previous movement and depicts at the beginning the "booming from heaven like a mighty wind" with powerful melodies through organ and kettledrums, as the outpouring of the Holy Ghost is described in the Acts of the Apostles. Out of these tones the song "Komm, Heiliger Geist, erfüll die Herzen deiner Gläubigen und entzünd in ihnen das Feuer deiner göttlichen Liebe" (Evangelical Songbook 156) is developed as a Pentecost hymn. In the interludes the lambency, which is visible in the third window as a symbol of the Holy Ghost, is heard as a musical theme. The ensemble flows into the jubilance of the Alleluja, which concludes the hymn and the whole work. Siegfried Karg-Elert was born in 1877 in Oberndorf at the Neckar. He studied at the Leipziger Konservatorium (Conservatory Leipzig), where he became a lecturer in 1907 for theory, composition and piano. In 1919 he succeeded the professorship for composition after the death of Reger. Although he was widely known as a composer and played the organ with virtuosity, his applications as a church musician were to no avail. Apart from numerous works for the organ he composed chamber- and orchestra music. On April 9th he died in Leipzig. Karg-Elert is a late romanticist who was forgotten over the rushing changes of the Twenties. Apart from the Cathedral Windows the Choral Studies op. 78 and the Choral Improvisations op. 65 are his best-known compositions for the organ. The six trio sonatas were composed by J. S. Bach (1685-1750), probably at the beginning of the time in Leipzig for the musical and technical education of the son Wilhelm Friedemann and other pupils. The outer arrangement of the pieces is identical, but not their expressions. The first movement (Vivace) of the sonata in C-minor is written in a concertante style. The largo is followed by a third movement in fugal style in allegro. Nicolaus Bruhns (1665-1697) was a pupil of Buxtehude. Before he was elected as organist to the Stadtkirche of Husum in 1689, he virtuously played the violin and organ while travelling and also spent some time in Copenhagen. The prelude in G-major is composed in the Northern German style and is, like the other preludes, shaped by the changes between passages, chords, short and slow phrases, improvisatory insertions and parts in fugal style. In the first fugue of the G-major prelude the use of the double pedal is striking. Furthermore, it is interesting that the fugues handle the same theme in different beat forms. Léon Boëllmann (1862-1897) was a well-known organ virtuoso in his time. He studied under E. Gigout and G. Lefèvre. He had his first employment as organist at the choir organ in St. Vincent de Paul in Paris (1881) where he became organiste titulaire of the main organ six years later. He could be heard as pianist and organist throughout Europe. The suite gothique is probably his best-known and most played composition. Retired since 2002, he lives in Witzenhausen / Werra today. born in 1979, studied Elemental Music Pedagogics (EMP) at the Richard-Strauss-Konservatorioum in Munich, with organ as a minor subject under Mr. Schloter. In 1999 she changed to the Academy and later on to the University of Protestant Church Music in Bayreuth and studied Church Music. She received organ instructions by H. Leuschner-Rostoski, T. Rothert and R. Gaar. She successfully finished her diploma of Church Music, her music teacher diploma for piano and organ and the music diploma for conduction in July 2005. She took master courses with Prof. H. Vogel (Hamburg), Prof. T. Laux (Düsseldorf), Prof. T. Escaich (Paris) and Prof. J. Laukvik (Stuttgart). born 1969 in Mainz. He received private tuition by Cornelis Teeling, solo timpanist at the Staatstheater Oldenburg. He studied at the Academy of Music in Würzburg under Prof. Siegfried Fink and Prof. Mark Lutz. Peter Friese worked in different orchestras as solo timpanist and drummer (Stadttheater Gießen, Hofer Symphoniker, Staatstheater Oldenburg, Landestheater Coburg). The artist participated in CD-productions (with Otto Waalkes among others), was engaged in tour orchestras (with Justus Frantz among others) and performed with various ensembles.